A Modern Hippie: New Look, Same Great Place! New Look, Same Great Place! My little blogging space has a new look and some great new features! The lovely Andrea from AB Design did an excellent job, don't you think?! In the next week I will be giving you a tour of my new design, highlighting the new areas of my blog! There are some areas not completed yet, but they will be done this week. With my new design comes some great new features and projects that I can not wait to share with you! Andrea did a great job with my design and I'm so happy to have a new look. Besides her design business, she also has a photography business. Stop by her lifestyle blog to see even more great photos. 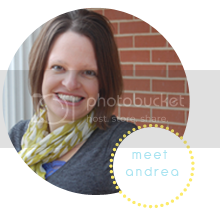 Thanks Andrea for working with me and designing a blog I love! Also coming up on the blog this week will be recaps of our life the past month. It has been a crazy busy month full of transition!